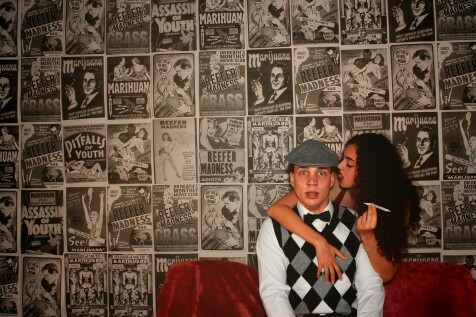 Joshua Ridge as Jimmy Harper and Georgia Vella as Sally DeBanis in Reefer Madness. Posted May 26, 2016 by Alannah Maher & filed under Arts & Entertainment, Theatre & Performance. The Rockdale Musical Society brings a laugh-out-loud musical satire to Sydney’s sinful Inner West for a strictly limited season. Remember the NSW Government’s ‘stoner sloth’ campaign from late last year? The one that was met with an onslaught of parody and ridicule, because actors dressed as clumsy sloths actually made marijuana use look adorable and hilarious? Well governments have long been struggling to hit the right notes when producing anti-weed propaganda – as far back as the 1930’s, it appears. Reefer Madness is an all-singing, all-dancing musical satire based on a much-mocked 1936 instructional film seen in American classrooms, which was intended to warn teenagers of the dangers of marijuana (and wild parties fuelled by jazz music?). By the late 90s the joke was still still running on a high, and writers/composers Kevin Murphy and Dan Studney saw it only fitting to turn it into a hilarious musical parody, which is now set to light up in Sydney. In his second production with Rockdale Musical Society, Joshua Ridge takes on the role of protagonist in this production as Jimmy Harper. Turning the ripe young age of 18 just this year, Joshua has already performed in more than 15 shows in addition to completing the HSC ­– a stark contrast to his character, whose life is turned upside down by the “demon weed”.